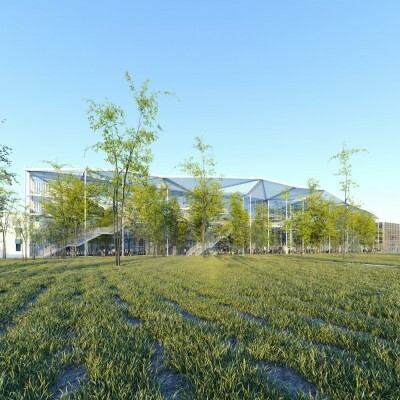 The office building with terraces sets a new standard for bio-climatic offices. 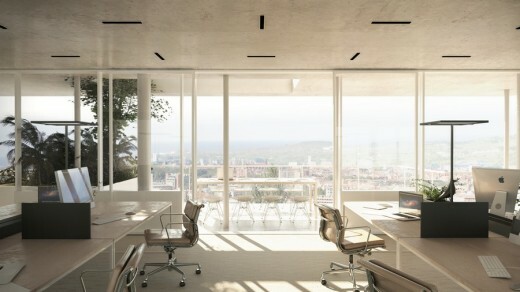 The project is rooted in the idea of flexible work spaces. 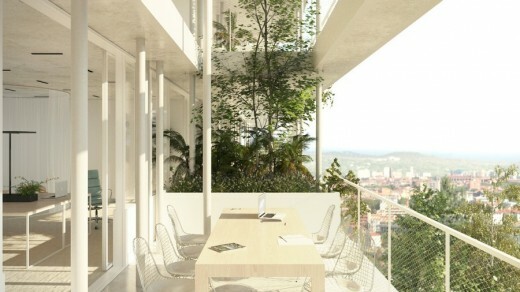 Its composition sets it apart from traditional offices blocks, and it is part of a strongly eco-conscious approach. This building with 6,400m² of office space and 600 m² of shopping floor space on the ground floor will be delivered in 2018, in the Nice Méridia urban technopole. 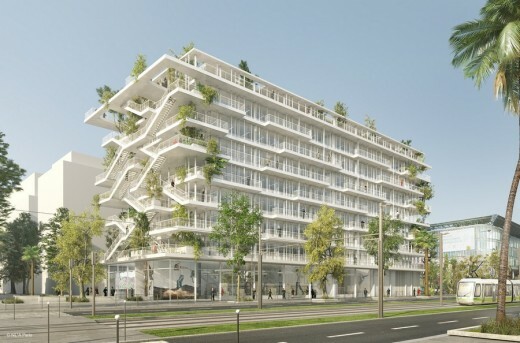 It was designed by the Nicolas Laisné Associés architecture firm. The Nice Méridia technopole is a priority development in the “Éco-Vallée”. It is expected to cover 200 hectares, with an initial 24 hectare operational sector. 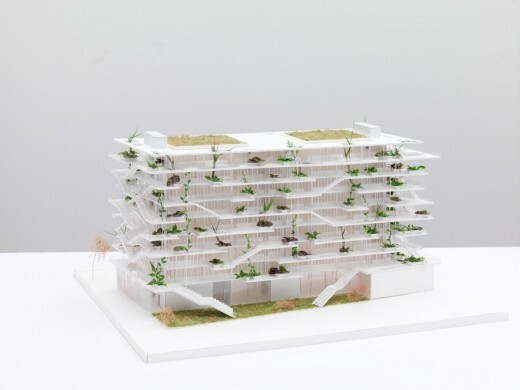 The design by Nicolas Laisné and Dimitri Roussel, associates at NL*A Paris, was short-listed alongside proposals by Cardete & Huet and TVK. On 6 March 2015, it was selected by the jury, in collaboration with the real estate promoter Pitch Promotion. Engineering consultants Grontmij, Le Sommer Environnement and Tangram Paysage are also on board to bring this project to fruition. The traditional organisation of a building has been reversed. The circulation passages, usually placed at the heart of the building, have been moved to the façades, and are completely open to the public space. The building is thus totally open to its environment. Key elements such as staircases and elevator shafts are arranged so as to optimise the remaining surfaces. Using a construction technique based around posts and beams frees up space on the platforms and offers greater flexibility in arranging the spaces. 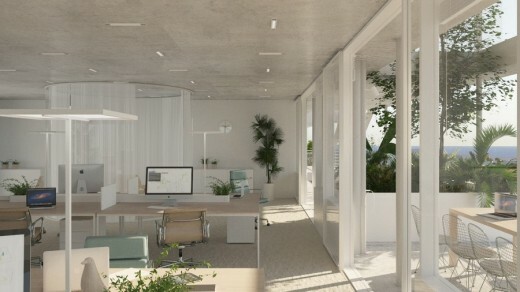 With the potential for open spaces, individual offices, partitions, or modular work stations, the space is designed to suit the needs of any company. Shops occupy the ground floor. The building overlooks Avenue Simone Veil and the Cours Méridia. 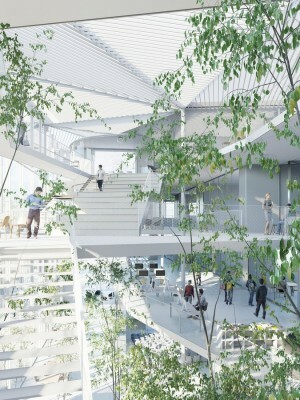 When they take the stairs on the outside of the building, users will enjoy sweeping, unobstructed views. The connecting hallways open lines of sight to the centre of the leafy island. The building’s façades are adapted in each direction to offer shelter from the sun. They function as interfaces between outside and inside to provide improved indoor climate control. More generous avant-corps elements protect the south-facing façade from the region’s strong sunlight. 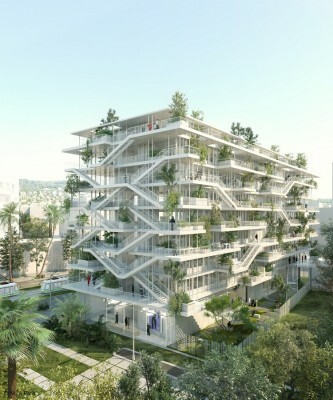 It also features an outdoor staircase bedecked with plants overlooking the Cours Méridia. 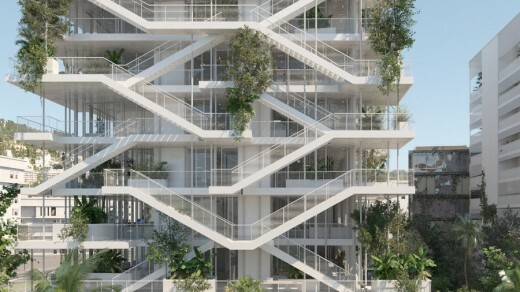 The façade at the heart of the island, to the west, features deeper balconies as it receives more horizontal light. The plants which cover it screen users from the housing blocks to be built on the island opposite. The large, free platforms, staircases and outdoor extensions invite building users to make the most of these informal, atypical spaces which open onto a garden. 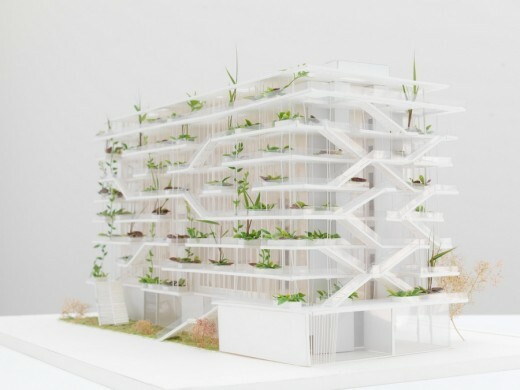 Most of the building will be covered in plants, and will change in appearance and colour with the seasons. From an environmental perspective, this project uses the Smart Grids approach (intelligent electrical distribution networks) within the framework of the “EcoCités” label process (minimal certification and commitment to a given level of performance) and will be certified BREEAM Very Good. It also adheres to the environmental recommendations presented in the Reference Framework for the CRQE (environmental quality for development and construction) set out by the EPA. President of the éco-Vallée EPA board. CEO of the Pitch Promotion Group. NL*A Paris is agency of architects, designers, builders and thinkers operating within the fields of architecture, urbanism, research and development. Our office counts about thirty employees working hand in hand with both private and public developers on a variety of projects. The scale of said projects range from small housing units to large office campuses with locations spread all over France. 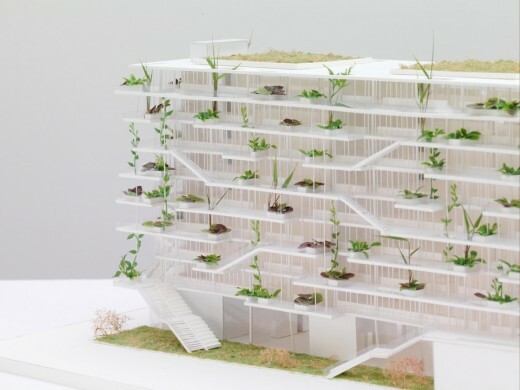 A graduate of the Marne la Vallée school of architecture, Nicolas Laisné set up his agency in Paris in 2003 after several years of working for renowned architects such as Jean Nouvel, Steven Holl, Raj Rawel and François Leclercq. He graduated from the Ecole Nationale Supérieure d’Architecture of Paris La Villette in 2007. 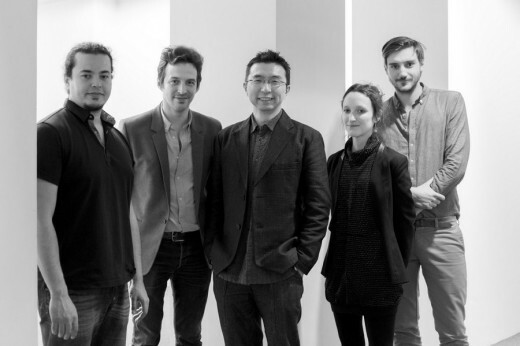 In February 2010, he joined Nicolas Laisné Architecte Urbaniste then set up the agency NL*A Paris in 2014 with his associate Nicolas Laisné.